Our bold use of colour creates modern and inspiring environments for both students and community users reinforcing the school’s new identity. At De La Salle School and Language College, our challenge was to reinvent the dated and rundown 1960s school, adding new state of the art facilities, while introducing community access. We created a new centre to the school linking all parts of what was an incoherent continually extended school. The new internal street provides a new educational resource area, learning resource centre, open teaching classrooms and a dining area. This significantly helped the flow of pupils around the school and they can now get to their classes on time. 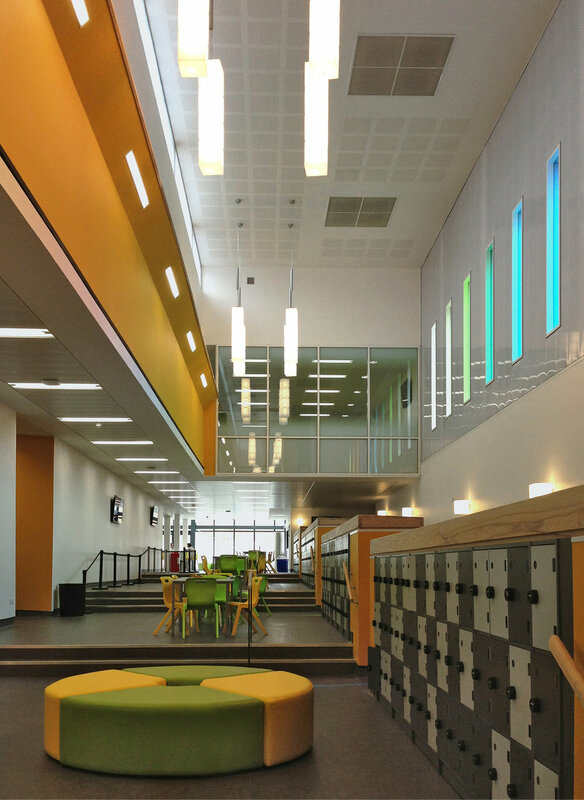 A new glowing chapel becomes the focal point and image for the school as the contemporary cantilevered room has translucent qualities and appears to float over the street. Our bold use of colour creates modern and inspiring spaces for both students and community users reinforcing the brand identity of the school.